My wishes fulfilled. I so wanted this amazing product from MAC that I can’t even express my desire here. 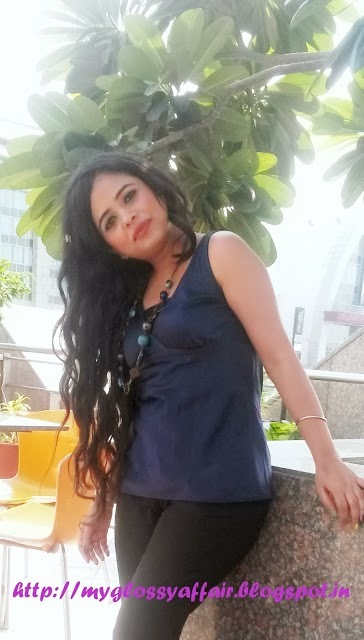 It was short everywhere, be it Select City Walk outlet or Shoppersstop Rajouri or anywhere in Delhi. But that didn’t dampen my spirit and I was sure of getting it one day. And then, came my savior, Ritcha. She went on a german project to Bangalore and in some gaming session there, requiring doing best makeup in 5 mins flat, she won and got this amazing little desire of mine as a prize. Sounds strange na!! Why on a German Interpretation project, would the company keep such a game – may be to please our lovely German counterparts J. Don’t know what was running in their minds but we got this ;). Yeeeaaaahhhhh, it’s true J J. A lightly frosted tinted powder that gives skin sheer, natural colour effects and highlights. Ideal for enhancing a skin tone or to accent or strengthen a tan. Skin – conditioning and formulated to provide a smooth, even application on all skin types. It comes in 4 colours – Golden, Refined Golden, Bronze, Matt Bronze. Packaging is soooo MAC – black case, sturdy, no mess, mirror, no applicator compartment, no brush. 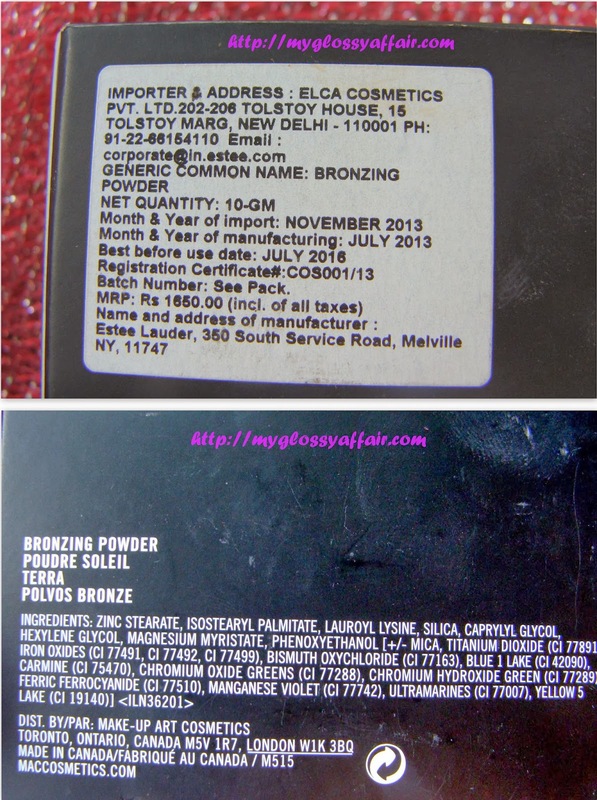 The package says Bronzing Powder and it is easy to distinguish it from their normal compacts due to the colour on the case. It is easy to carry around and travel friendly. The texture is very fine and soft and smooth. It is very easy to apply and blend. Since there is no shimmer and it’s completely matt texture, you can build it up as you like for contouring purposes. There is no fallout or wastage of product. But, it doesn’t come up easily on brush in 1 swipe but you have to repeat the process for atleast 3-4 times to do any proper contouring. The colour doesn’t show up with any less. As for the pigmentation, that’s quite good. Again as all MAC products, staying power is quite good. In fact, it doesn’t budge anywhere for atleast 4-5 hours, but you won’t rub it, I am sure J, else it would all go. And yes, the staying power is not more than that J. Is is dark brown and matt and suits perfectly for fair skin tones say NC 30, 35 and 1-2 shades here and there. I am in love with this as I knew beforehand that it is surely good. I have tried this one on few occasions from MAC store and have always loved it, its staying power, colour, coverage, everything. 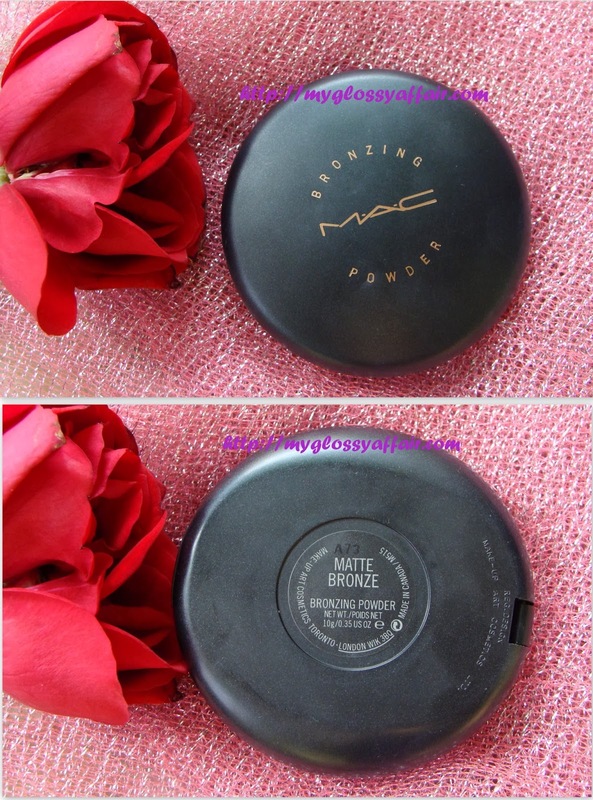 This is one of those few matt bronzers that don’t make you look dirty, has no shimmer and it is perfectly pigmented like most MAC products. It is perfect for contouring. It’s a dark tone and not too orangey. But one word from me – TRY IT BEFOREHAND!! It works very well for fair skin tones but sometimes doesn’t work for wheatish skin tones for contouring needs. May be, only I felt that but I felt that. Check my complexion here. That’s why I got another one too – MAC Sun Power – that is slight orange but works perfectly for me and shows up on my face. I will review it soon. Wella Bloggers Meet and Festive Season Outfit Post. Does contouring brilliantly if the shade suits you. Texture is very fine and smooth and soft. Good quantity given – 10ml. 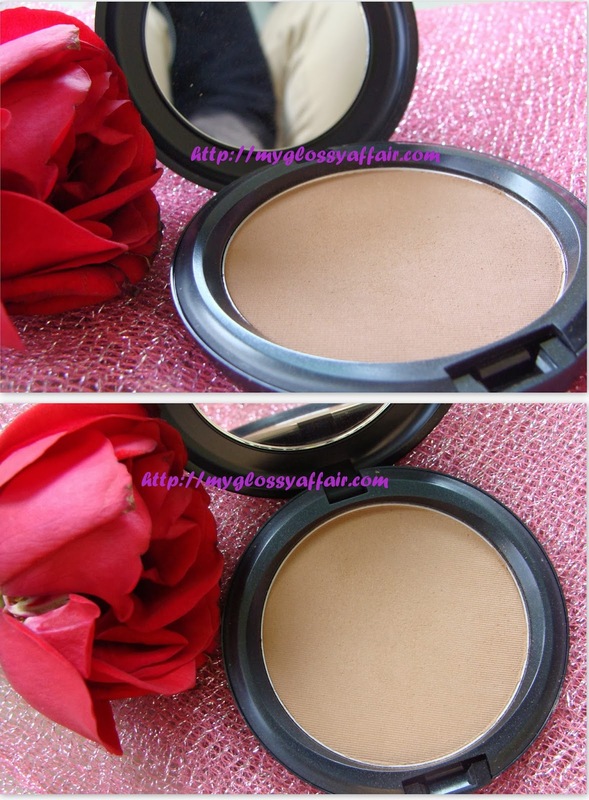 Works well for contouring as well as for blush/ bronzer. Staying power is also decent. Love its matt finish, no shimmers at all. Good for daily wear, it doesn’t look fake. Gives a natural finish. Very less product comes up on the brush in one swipe.With 3-4 swipes for 1 application, I will finish it soon and at that price, I find it bad J.
Thankyou so much Megha 🙂 And yes it is perfect for contouring!! Awww thanks a ton love 🙂 You should go for this one!! Danke Liebe Rena, es ist so lieb von Dir und ich kann gar nicht glauben, was Du schreibst, denn ich sehe mich selber total anders 🙂 Ich bete dich und liebe dich auch!! 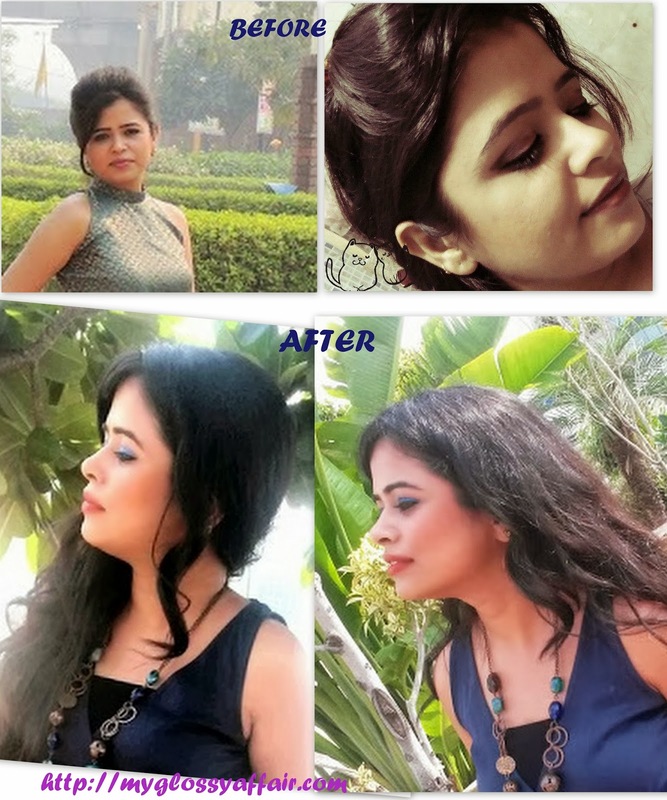 Lovely pics Charu..looks great on you. Following you on G+….pls add me in your circles too.